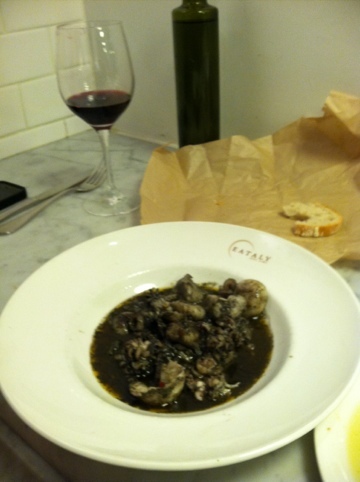 I don’t think he needs the publicity, but I don’t get out much and this sumptuous bowl of baby cuttlefish in its own ink with ramps and chilis at Eataly in NYC just blew me away. I’ve been a fan of Mario Batali since the early days of The Food Network, because he seems so real, and translates Italian food for us Americans in an informative and non-condescending way. But I’d never been to any of his restaurants, for lack of opportunity, until the other day when I wandered the aisles of the emporium/extravaganza of all things tasty and Italian that is Eataly (which he founded along with Oscar Farinetti, Joe Bastianich and Lidia Matticchio Bastianich). 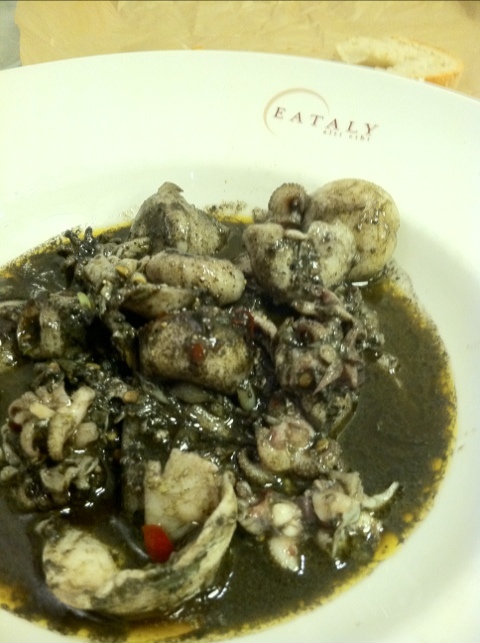 In the seafood section I was very excited to see baby cuttlefish (seppioline), rare on American menus. It’s in the cephalopod family and sort of a cross in flavor and texture between squid and octopus. I adore cuttlefish and would be thrilled if it became easier to find in seafood markets and restaurants. The beautiful midnight-black sauce of ink (cuttlefish ink was historically used as ink for writing, and the sepia in “sepia-toned” comes from seppia) enriched with the aromatic and savory ramps (wild spring onions) was absolutely sublime, best thing I’ve had in a long time. Heaven.